There are many types of fur ruffs on hoods. Parkas often have fur ruffs and some cloth coats also have fur trim on hoods. The choice of fur is quite wide, but the fur is usually a long haired type of fur. Although some parkas come with fake fur, that won't be discussed here, other than the possibility of replacing it with natural fur. Many arctic references and elders suggest that wolverine and wolf are the best furs to use for ruffs. Both have coarser stiff fur on long length with dense undercoats. There are discussions about hollow hairs icing up less but I have no personal experience with a ruff made of either of these furs. Several commercial parka manufacturers, such as Canada Goose, have chosen coyote fur for their ruffs. Coyote guard hairs are almost as stiff as wolf. I have worn hoods with coyote ruffs for many years and find them very servicable. Fox is another fur that is used for ruffs by some manufacturers. 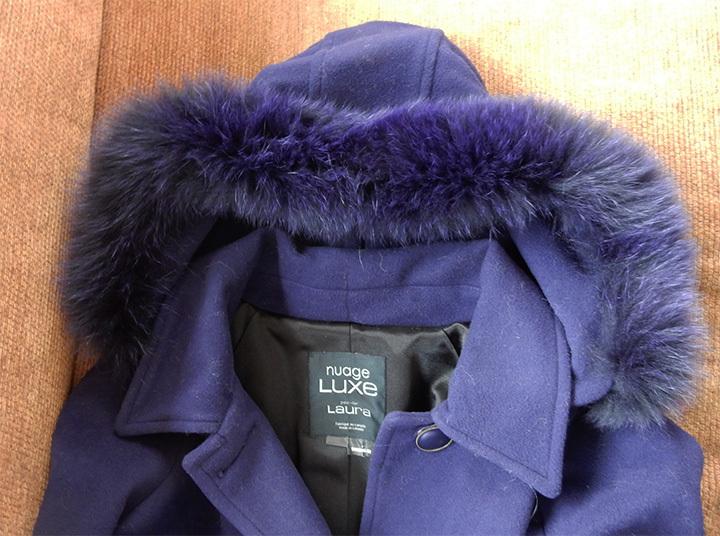 The Canadian made hood on the 3/4 length wool coat at the left has a fox ruff dyed to match the wool color. Fox fur is much softer than wolf or even coyote, but that has its own appeal. Personally, I prefer fur in natural colors but each designer makes their own choice. Sometimes tails, connected together are used for parka ruffs. It takes about 3 coyote or red fox tails for one ruff. If farmed fox is chosen, perhaps 2 might be sufficient, but 3 would likely still be better. One would need more from a raccoon. Several fur suppliers sell a specific product made from tails that are already attached to twill tape. These are the easiest for a home sewer to use. The three strips shown on the right are coyote, silver fox, arctic fox. The strips are typically 26-27" long which is considered the typical length for a parka hood edge. These were purchased from Bill Worb Furs, Inc." in Winnipeg. A wide variety of both wild and farmed fur is available. These three are wild fur. Melton coating, duffle coating, patterns and fur for ruffs are all available from McFee Workshop that offers online or phone ordering also. If you decide you want to use fur from the body of a coyote, the midline section is the longest and can make a quite spectacular ruff. Typically a three inch section is used on a standard hood. In this case it would be best to add twill tape to each edge or to sew on a 3 inch backing fabric in a color that matches the coat or the fur. The green wool duffle coat on the left has a 3 inch raccoon piece sewn onto a wider strip of green kasha lining that matches the coat. Funnel hoods require a slightly different type of fur ruff. These hoods typically have a drawstring around the insulated hood that tightens over the face. Then an additional flap of material can be drawn out and beyond the face to create a funnel. If fur is added to this flap, it should be on the inside near the face when drawn out but will then be on the outside of the hood when the flap is turned back away from the face in warmer weather. 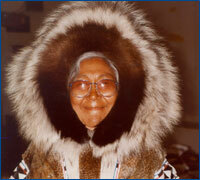 Innuit peoples of the western arctic made a special type of fur ruff, known as a "sunburst" ruff. This ruff was worn in a hood that sat behind the cheekbones of the face but tightly around the face in that position. The fur stood out a great distance from the head and was composed of many pieces of fur joined together. These pieces were somewhat pie shaped, narrower at the face and wider at the outer edge of the ruff. Aline J Cotel1, Raymond Golingo, Jill E Oakes, Rick R Riewe. 2004. 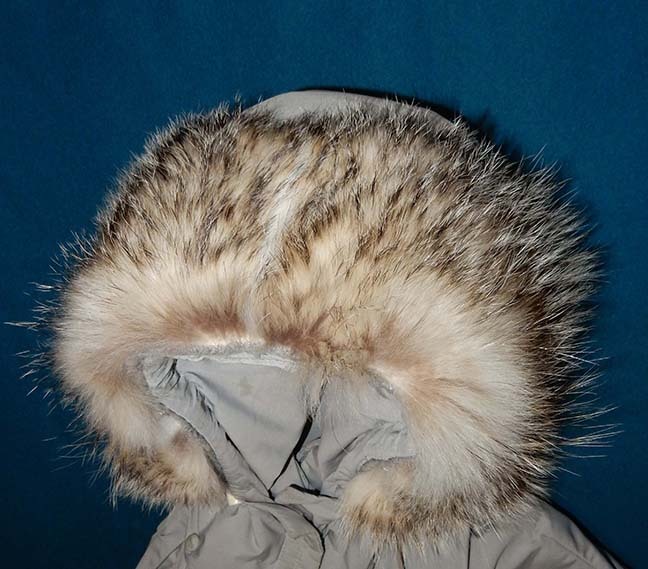 Effect of ancient Inuit fur parka ruffs on facial heat transfer. Climate Research. 26:77-84. This manuscript describes the results of a study using a wind tunnel with various types and styles of fur ruffs on the heat transfer measured head of a model. The authors concluded that the traditional "sunburst" ruff allowed for the lowest heat transfer at many wind speeds and angles. The preferred fur of Innuit elders was wolverine or wolf. 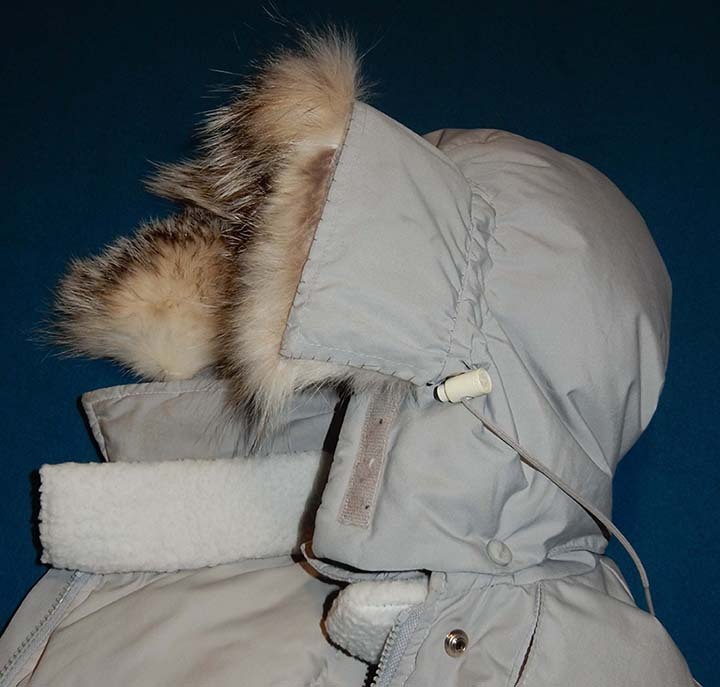 Some purchased parkas, such as those made by Canada Goose have coyote ruffs that attach to the hood via a zipper. One can order replacement fur from Canada Goose in case the original fur becomes damaged or the guard hairs break off after a few years of use. Many people whip stitch the twill tape or fabric backing to the hood by hand. When the parka needs to be washed or the cloth coat dry cleaned, the fur is removed and resewn back onto the clean garment. The ruff at the right is made from coyote tails that were attached to a strip of beige kasha lining which was whipstitched to the inside of the the hood. The coat is made of beige melton cloth. Another option is to use "snap tape" on one side of the fur ruff. This is twill tape that comes with snaps every few inches. 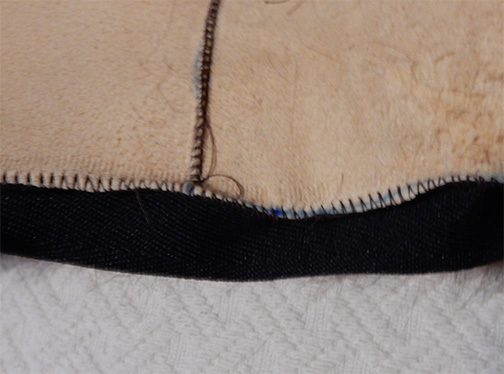 In this case, one of the matching pieces of twill tape is sewn to the hood and the other attached to the fur strip. This might be a good choice for someone who needs to wear a work parka that has to be cleaned often. Choose snap tape that has sturdy metal snaps, rather than the other type which has tiny plastic snaps. Although for "work parkas", an outer shell made of nylon or storm cloth that slips over the parka is probably a more servicable option. These outer shells can be machine washed and dried easily, preserving the integrity of the down in the parka longer or the wool coat underneath. 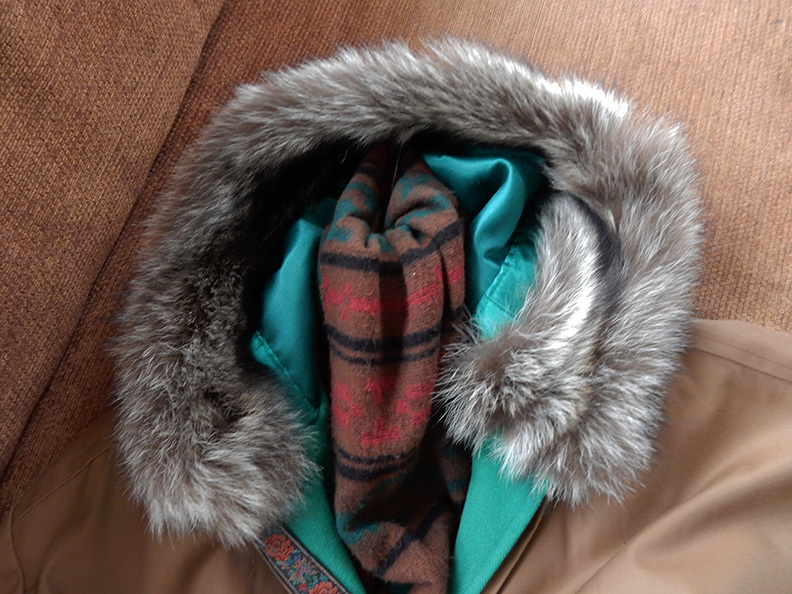 The green duffle coat above, with a raccoon ruff, has a brown storm cloth shell. After acquiring a pelt that is garment tanned, mark the strips you want to cut out. The strip at the left is from a raccoon and is 3 inches wide. Mark the cut lines with a straight edge using pen or felt marker. Use a furrier knife, scalpel or razor blade to cut through the pelt from the leather side, to leave the fur intact. In order to get the required length for a hood, one would need at least two strips from most raccoons. It's your choice whether you attach the two strips together with all the fur going in the same direction or whether you attach them with the fur going in opposite directions. If the later is chosen, be sure to have that seam at the top of the hood so that the fur on each side of the hood matches. 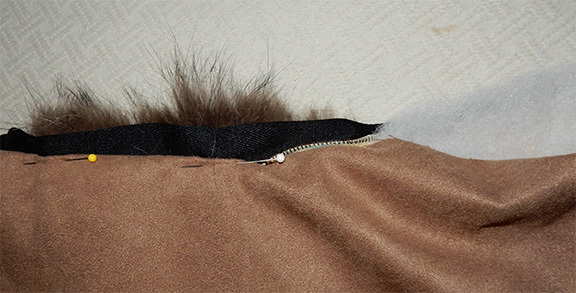 The photo shows two strips of fur sewn together using a fur sewing machine. Hand stitches close together can also be used. 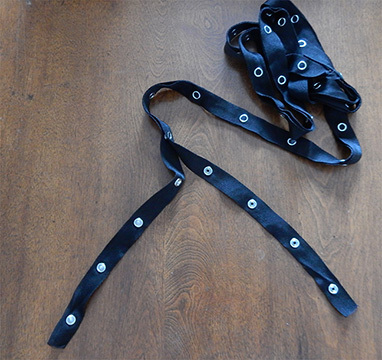 A twill tape strip has been machine sewn onto one edge of the fur strip. I usually also extend the twill tape over each end of the fur strip. For a fur strip to be used on the inner edge of a hood, I usually attach one egde of the fur to a fabric strip. Since I make many of my coats from wool, lined with kasha (flannel backed satin lining), I usually have leftover lining. I cut out a strip of lining about 8 inches wide and fold it over. I fold under a bit on each end but leave the long edges raw. I use a zig-zag stitch to sew the ends and long edges together. It's the zig-zagged edge that I attach to one edge of the fur. Many people put a layer of thin batting of polyester or wool under the fur. This is meant to help make the fur stand up more. I then fold the bias tape or twill tape under and hand stitch it to the lining strip. 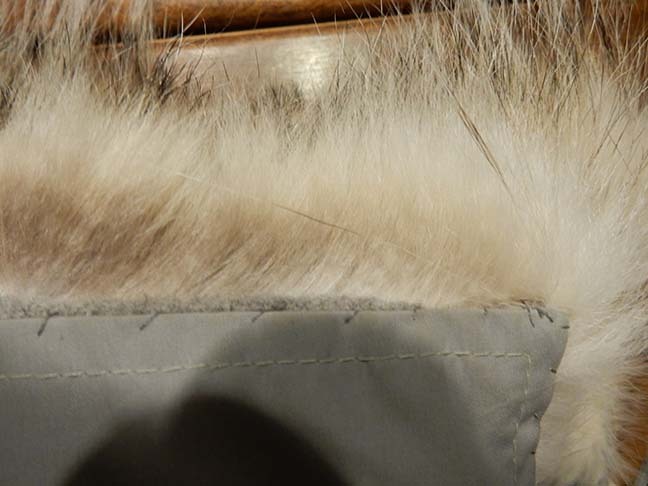 When completed, the fur has lining beneath it and about 1 inch of folded over lining extends beyond the fur on one edge. This could be less, if you do not have matching lining that you are will to have show. In the photo at the right synthetic suede is used as the backing with polyester batting in between, and the fabric edge abutts the fur edge. Funnel hoods often have quite a deep funnel band. This band can be straight or more similar to a sunburst effect. The hood described here was straight, 3.5 inches deep. It was constructed of the fabric of the outershell of this down parka with no stiff interlining. Such a funnel would not support fur that was soft, such as fox, unless a stiff interfacing was added. However, my friend chose badger for her ruff and badger has a very stiff leather so interfacing was not required. To make the ruff, I choose to use grey wool melton underlining. Because the wool was firm but still soft, I did not add any batting inside either. The fur was cut from the badger pelt in several pieces and these were sewn together. One should match the pieces to balance to look of the fur on both sides of the face. As described above, sew one side of the ruff to the underlining, which was wool in this case. Also sew the fur to the wool at both ends. On the other long side, attach bias tape that matches the wool. This bias tape edge is then turned under and hand stitched to the wool underlining. This makes a ruff of fur on wool with all the edges encased. 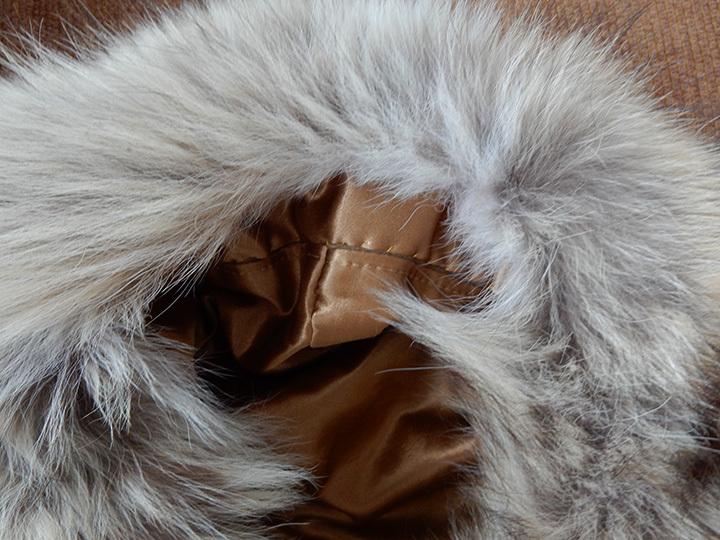 Whipstitch this encased fur strip to the funnel portion of the hood on all four sides. Be careful to ensure that the edge near the actual hood will still freely fold back or forward, after the fur is attached. Creature Comforts: Fur Ruffs. by Amanda Byrd. Mushing, the magazine of dog-powered adventure. September 1, 2007. Adding a Removable Fur Ruff. by "Jawax", November 11, 2015. A winter trekking blog that includes good instructions and photos about making a ruff from a coyote pelt.